Happening for a while - White Girl Bleed a Lot, Knockout Game, black on white crime. 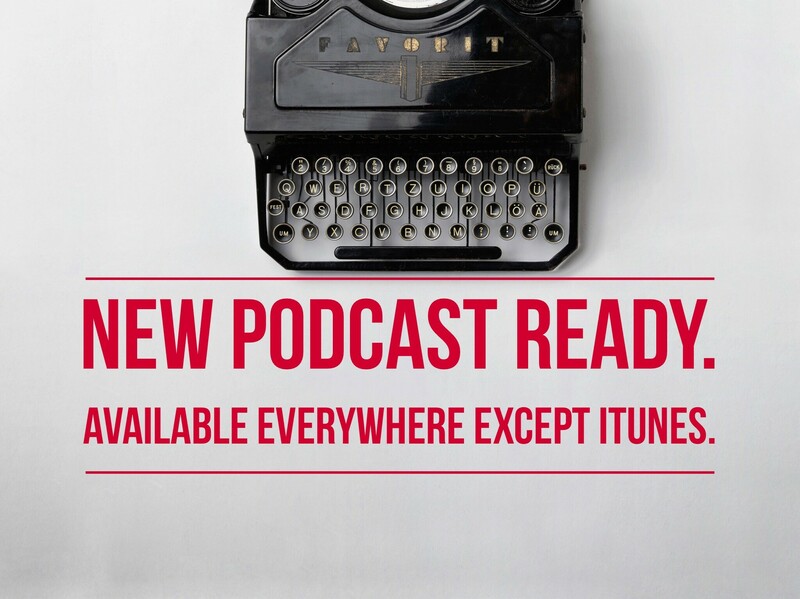 New Podcast: Journalism 101- Or, How to Find Great Stories in Memphis. Journey 101: Or, How to Find Great Stories in Memphis. Memphis is a dangerous and dirty place. More so than reporters and public officials let us know. This podcast talks about how to find stories i˜a place like Memphis. And how to expose those in denial, deceit and delusion. New Podcast: New episodes of violence and denial from Baltimore and … the Wall Street Journal?????? We usually have to wait a few decades to figure out how a reporter or news anchor feels about the topics they are covering. A reporter from the Wall Street Journal saved us the wait and talked about how the Tea Party is crazy and racist. And in Baltimore, the head of the symphony — you know, the chick who makes a million dollars a year waving a stick around — she said violence is necessary there because that is the only way black people can get the attention of the racist white people. Every time I listen to your podcast I think of comments. I have sent links to your books to two of northeast Ohio’s most popular radio talk show hosts, Mike Trivisonno and Bob Frantz. First comment – one of your recent podcasts mentioned events that have shaped one’s views on race, and one came to mind of a family picnic back in the 70’s at a park in the eastern suburbs. At that time, Blacks were not often seen outside Cleveland city limits, but a large group of “teens” and their elders showed up at the suburban park and took over (literally) the ball field on which we were playing softball. They arrived in several cars, and just came onto the field saying something to the effect (as best I can remember) “You had this field long enough – us niggas are taking over.” I don’t remember what happened after that; there must not have been any fight – that I would remember. I think we tried to just keep playing but they spread out over the field and started playing their own game while we were still finishing. Second comment: another thing that has affected many Clevelanders’ views on race is the loss of so many social & cultural places and events. Beginning with the closure of Euclid Beach Park in 1969 – this really turned off the generation just before me – most Whites in Cleveland blamed blacks for the closure because of the fights and crime that accompanied their presence at the free-admission park. Families stopped going because it was no longer safe; my own brother was robbed at knife point at the park by a couple “youths” when he was ten. The park subsequently shut down and now the property is mostly taken up by low cost apartments & section 8 units. The park and its downfall has a legendary status in Cleveland among whites. Besides losing the amusement park, starting in the early 2000’s we lost The Waterloo Street Festival (S. Waterloo Road), The Old World Festival (E.185 Street), The Euclid City Summer Festival, and finally The Euclid City July 4th Fireworks. The latter event was attended by people from miles around – it was known as the BEST fireworks show within 20 miles or more. But the usual problems of uncontrollable teens causing mayhem all over the city, and especially at the city park before, during, and after the fireworks caused the city to cancel “due to financial and insurance reasons.” But ask any Euclid cop or any official under anonymity and they will tell you the same – the police could no longer keep certain people at the event and around the city in line. Of course, the fall of the city of Euclid was bad enough – at one time one of the top suburbs of Cleveland; one of the best school districts in the state of Ohio – now practically a ghetto. It’s very sad, and it makes a lot of us angry, depressed, or both. There was another thing, but it’s slipped my mind for the moment. It’ll come to me during the next podcast. BTW, don’t be too quick to dismiss the “White Nationalists” and segregationists. They are not all skinheads, nazis, or whackos. Do you read anything at Vdare.com? It’s a great website. John Derbyshire is one of my favorites. Understanding these problems and their sources inexorably leads to some degree of nationalism and segregation. In small numbers, we can coexist well. But in ratios greater than say 10-15%, you and I can see it’s not working. What is the solution? Not sure, but I would say freedom of association should be an option, but that has been taken from us even though it is guaranteed by the Constitution. 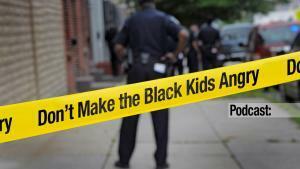 White mother and neighbor charged with a crime after being victims of black mob violence. 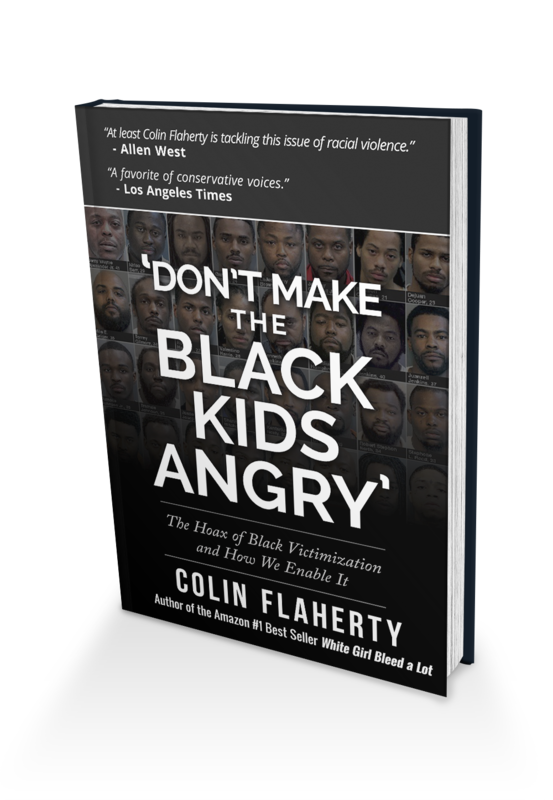 Whew: I have a whole chapter in Don’t Make the Black Kids Angry about white people who are victims of black mob violence who are charged with a crime. Here’s an interview with the woman who is just the latest. We will stay on top of this one. 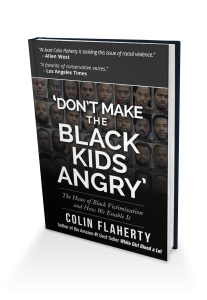 His new book is Don’t Make the Black Kids Angry: The hoax of black victimization and those who enable it, is available all the usual locations, including Amazon and wherever fine books are sold. 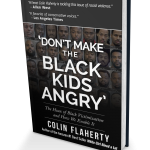 New review of Don’t Make the Black Kids Angry. 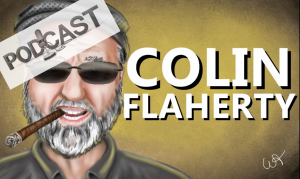 I am just about finished Colin’s newest work and it is packed with information, statistics and real life victim’s (the ones who survived) own words. What is even more of a shock (but not too much more) is the way the media has outright used “The Lie of Omission” in not covering these many incidents or purposely leave out the clear fact that “Black Mob Violence” is just that ….BLACK. The lame stream news media has repeatedly shown it’s true colors in being silent to this horrible tragedy that has driven the so-called ‘black community’ – backwards and how they are the laughing stock of the rest of the world not to mention the government that EABLES this freak show to continue. 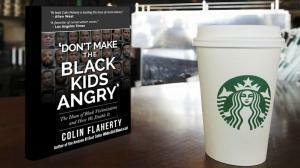 A highly recommended book for ALL races and one that simply says it like it is. 5 stars and both thumbs way up!!! Black mob violence at the Grammy’s: During and after the show. If we are going to portray black people as relentless victims of white violence, it would help if black people started acting that way. Black mob violence at Christmas: lots of it! Part Deux. Black mob violence at Christmas: lots of it! Here is the link to a new article from American Thinker. Videos below. Christmas Day Black violence directed at cops. I started with two cases, one in Texas, the other Rhode Island. By the time I finished this video, I had another. Then all of a sudden a lot more …. violence, denial, racial resentment. All over the country. And when I thought I had run out, more examples appeared. Arden Mall site of black mob violence in Sacramento. Independence Mall near Kansas City, black mob violence. Black mob violence closes Navy Pier Christmas Party. Second City Cop on black mob violence in Chicago. More black mob violence from Sacramento. Black mob violence at Wolfchase Galleria mall. Black mob violence in Lakeland, Florida. 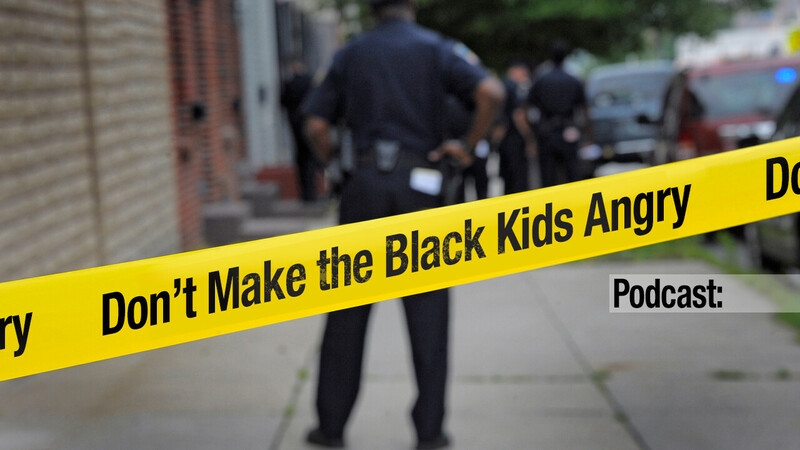 Monroeville Mall and black mob violence near Pittsburgh. Black mob violence in Orlando. Black mob violence in Sacramento.